However, this recent disaster got me thinking, why am I using a remote timer like this in the first place? I know part of its use is to isolate camera shake, but my main reason is so I can take longer exposures than the maximum of 30 seconds using the settings in the camera alone. Like a whole host of other landscape photographers I enjoy taking pre-dawn and sunrise shots, where the light levels are low and exposures times are long, often well in excess of the limiting and punitive 30 seconds maximum allowed by the camera settings. As landscape photographers we are always being told that the best light to be had is within Golden Hours, that magical time around sunrise and sunset when the sun is below or only just above the horizon and suns light takes on a wonderful, golden, warm hue as it is filtered through the low atmosphere. Are there no landscape photographers at Canon? Does no one at Canon take exposures longer than 30 seconds? My 5D Mark II is a sophisticated beast, with way more processing power than several of my early PC’s no doubt (8086 processors .. remember them? ), so why do I need a clumsy, dangly, plug-in wired contraption to take long exposures. Well I don’t I hear several of you say; I can just put the camera in bulb mode and time my exposure; my 5D MII even has a second counter on the LCD display on the top, but that’s if I could see the dam thing. Yes well, right, but that’s not the point. The point I’m trying to make is that surely all the functionality of the TC-80N3 remote timer could (should) be added to the Camera by a simple firmware upgrade? The processing power is surely present in-camera already, probably the software functionality too, but I somehow doubt the if willingness is there for Canon to implement these features. If you’ve never used a remote timer then perhaps you’ve missed out. Apart from being able to set exposure times from 1 second up to an incedible 99 hours, 59 minutes and 59 seconds, you can set similar values for the self timer (time before the shutter is activated), the interval timer (time between exposures) and exposure count from 1 to 99 exposures, although I’m not sure why the exposure count has been limited to just 99 exposures. Thus with the TC-80N3 you can takes exposure of almost any length which is ideal if you happen to be a fan of using a 10-stop ND such as the Lee Big Stopper, low light photography at sunrise or sunset, or even astrophotography. I particularly like the ability to set the self timer to any value since if you ever tried shooting landscape with a 70-200mm zoom or any other long lens, then tripod vibration can be a big problem, so allowing a long rest period before the shutter is activated can improve sharpness considerably. God knows why you can only choose 2 or 10 seconds for this in your camera; surely we should be able to set any value? It’s funny how when every new camera is released that the makers focus (no pun intended) largely on new features rather than improving existing ones, and much has done with movie features. We seldom see major changes in firmware to change old functions. 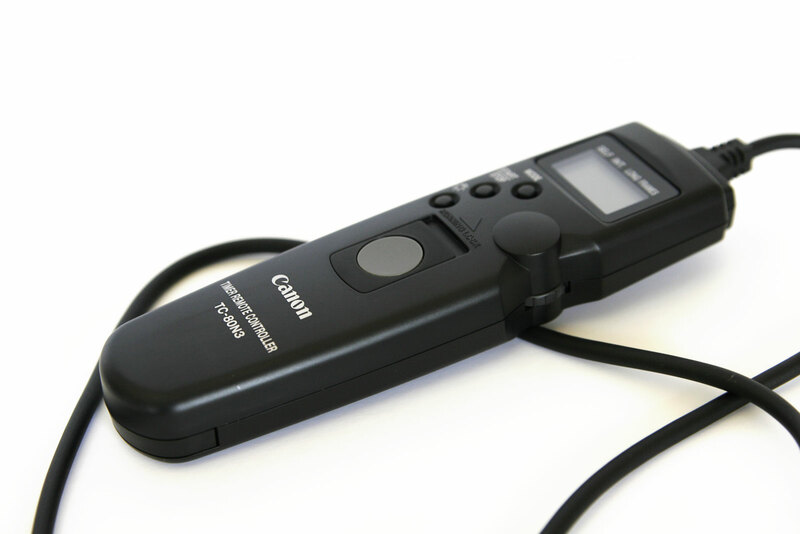 Really we shouldn’t need a device like the TC-80N3 remote timer, all that functionality should be in-camera, and the most required would be a simple cable release remote cable. All this functionality would be a doddle for Canon to implement in a firmware upgrade but I get the feeling they would much rather you buy their over priced accessory. Thankfully their are many remoter timer clones to be bought on eBay and Amazon nowadays at less than a quarter of the price of an original Canon. I’ve tried a few and they are just as good, if perhaps not quite as good in build quality, but at a 75% saving surely sales of the originals must have plummeted. I’d love Canon to take note but won’t hold out my hopes; they seem obsessed with making our DSLR’s into movie cameras these days. However, many of us continue to be stills photographers!